Aaron Shanagher came off the bench to fire a vital goal for Davy Fitzgerald’s side. 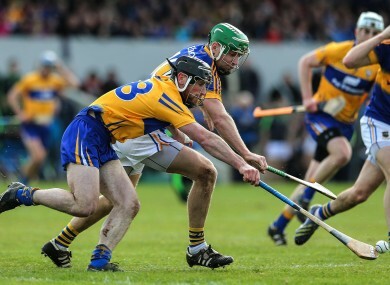 Clare's Gearoid O'Connell and Noel McGrath of Tipperary battling for possession. A GOAL FROM substitute Aron Shanagher produced a dramatic late turnaround in Cusack Park as Clare snatched a minimum victory over neighbours Tipperary in today’s league quarter-final. Having trailed by two points at the break, Tipperary upped the ante in the second period and appeared to have momentum behind them as they hit the front by three with less than ten minutes remaining. However, Clare’s bench was instrumental in digging out a result as Cathal O’Connell arrowed over a free before Shanagher took on the visitors’ last line and batted to the net in the 66th minute to irrevocably swing the tie in the hosts favour. While Clare took their opportunities well, Tipperary will look back on a poor return of 18 wides over the 70 minutes including four after Clare’s winning goal, any of which would have forced extra-time. That profligacy hampered the Premier County throughout in what was an even game that finally ignited in the 19th minute when John Conlon expertly controlled an Aaron Cunningham crossfield pass to billow the net and hand the home side a 1-4 to 0-2 advantage. Tipperary would respond mainly through John McGrath to lower the deficit to just two by the break at 1-7 to 0-8, albeit that they should have been at least on level terms as Seamus Callanan uncharacteristically passed up three easy frees. With the introduction of Kieran Bergin on the restart, Tipperary bounded back into the contest to finally gain parity by the 51st minute, with three more from McGrath helping them to a 0-17 to 1-11 lead by the 61st minute. However, they failed to close out the game, and once Shanagher pounced, Clare received the perfect shot in the arm to hold out for victory, their tenth in total in 2016, and set-up a semi-final meeting with All-Ireland champions Kilkenny in a fortnight’s time. Email “Super sub Shanagher's goal hands Clare win over Tipperary and place in league semi-finals”. Feedback on “Super sub Shanagher's goal hands Clare win over Tipperary and place in league semi-finals”.